When bitter rivals play each other a whopping 12 times during a 76 game regular season, the late season meetings often feature a plethora of hostility and bad blood. Throw in a 7 Game playoff series with a spot in the Eastern Conference Final on the line, and things will undoubtedly boil over rather quickly. Boy did it ever, after Game 1 there is already talk of fines and suspensions, and injuries to key players. Let's talk about the game itself first. Rookie speedster Daniel Sprong opened the scoring just 45 seconds into the series opener after Dustin Jeffrey slid a pass through the neutral zone that sent Sprong in all alone. 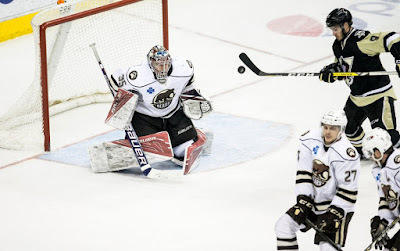 The 19 year old baby face did the rest as he buried a snipe over the glove hand of Hershey Goalie Justin Peters. The Penguins controlled the majority of the first period, and missed a chance to add to the lead after Guentzel (another rookie) was stopped on a penalty shot late. Much like in the opening period the Pens used the opening shift to twist the knife into their bitter rivals from the south. Carter Rowney tipped home a Ryan Parent point shot in the first minute to make it a 2-0 lead. 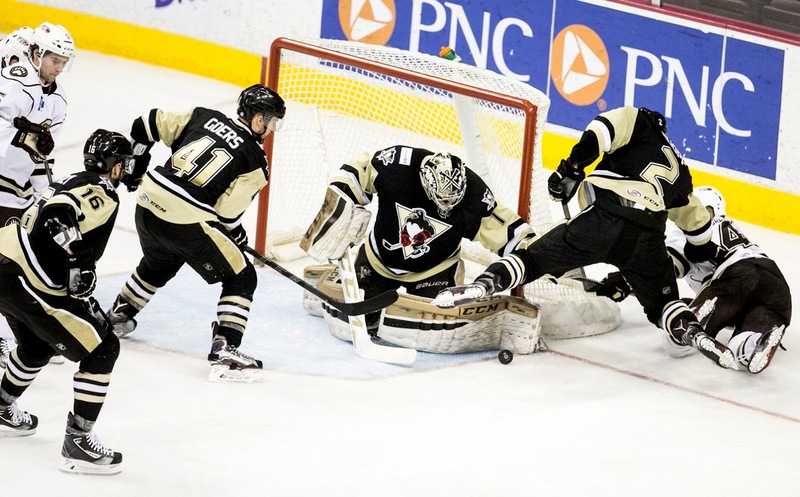 The Bears would eventually apply some pressure during the stanza, but rookie sensation Casey DeSmith stopped every shot he would face. The defense core of the Penguins did a very good job of keeping the majority of Hershey's chances to the outside and helped limit the rebound chances. In fairness to the Bears, they did miss some chances that quite frankly normally end up in the back of the net, but that's the way playoff hockey goes. Sometimes the pressure forces a scorer to grip his stick just a bit to tight. In the 3rd period is when things began to get a bit heated. 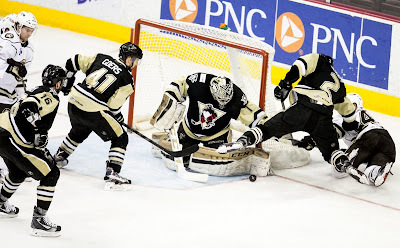 First on a power play Daniel Sprong would bomb a shot from the point and beat Peters for his 2nd of the night and league-leading 5th of the playoffs. Then about midway through, Carter Rowney was called for tripping and would sit for 2 minutes. Upon replay of the Penalty, it was clear that Rowney didn't trip the Bears skater at all, but rather blind-sided him with a heavy hit to the high shoulder area. It wasn't a "clean" hit per se, but the player's head was down, and Rowney made initial contact to the shoulder. I wouldn't expect disciplinary action from the league, but crazier things have happened. 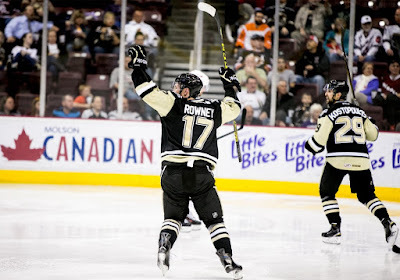 Needless to say that with the Bears already losing by 3 goals, the Rowney hit was enough to set off the powder keg laying in wait at the Giant Center. In the closing minute (19:31 of the 3rd to be exact) Hershey's known agitator Liam O'Brien took a clear run at Pens sharp-shooter Dominik Simon as he played a puck alond the boards. O'Brien took a solid 4-5 strides and absolutely went right through Simon on his way to a Game Misconduct and a 5 minute major penalty for charging. During the ensuing dust-up both Matthias Plachta of the Penguins and Riley Barber of the Bears were issued matching 10 minute misconducts for Unsportsmanlike Conduct. I would be absolutely stunned if O'Brien wasn't suspended for at least one game of this series for the hit. Dominik Simon was absent from practice Thursday and was being evaluated for an "upper body injury." In other words, Simon is dealing with concussion symptoms and likely won't play in Game 2 and maybe longer. It should come as no surprise to anyone who is familiar with this rivalry, that it took less than one full game for these two teams to prove that there is a deep rooted hatred for one another. Hopefully the AHL will take control of this series, much like the NHL has done in the battle between the two parent clubs. Regardless, the bloodshed has only just begun in the battle for Atlantic Division supremacy. If you enjoy physical, bruising hockey than this is a series that you should tune into sooner rather than later. Game 2 will be Friday night at 7:00pm from the Giant Center, before the series shifts to Wilkes-Barre Township for Game 3 Saturday Night at 7:05pm.